My favorite little pampering treat to myself is painting my nails. My mom has pretty much forbid me from purchasing any more nail polishes because according to her I have too many. While I agree that my supply is rather extensive, the bright colors always lure me in. Painting your nails or getting a new nail polish color is the perfect little pick me up not to mention that freshly manicured nails make you look very put together. Specifically, Essie is my favorite. It must be something about how pretty their bottles are but the names and colors definitely help for me to seal the deal when it comes to purchasing a new one! Personally nail polishes do double duty and serve as decoration as well! 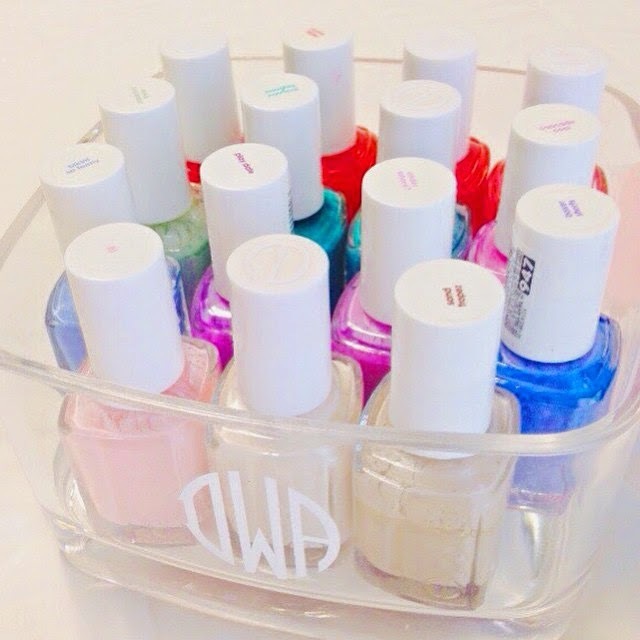 I have all of mine stored in this adorable monogrammed container that perfectly fits 15 polishes! Since I have accumulated quite a few I love sharing my favorites with y'all (This counts as giving back right? Hopefully making the number of polishes I own less embarrassing). In return feel free to tempt me with your personal favorites! My favorites for spring are shop able below! Lately I have been wearing Fiji, Sand Tropez, and Cute as a Button on repeat! I love doing my nails as well! I kind of stink at it and it takes some time, but its better than paying for it at the salon. I love Essie (my recent fav is Haute in Heat) and OPI.